It's important to move on from purée to soft chunks when your little one is ready because chewing is an essential part of the weaning learning curve. Chewing develops jaw muscles which are vital to babies' speech development. That's why our meals contain soft chunks and no spouts to squeeze them through, (By the way prolonged sucking on spouts may adversely change the way your little one's teeth grow). Lots of baby meals contain a high percentage of fruit, which means they are very acidic a cause of tooth decay in little ones. Our chef and nutritionist have developed Little Bistro® meals to be packed with veggies so they're better for tiny teeth, even those that haven't come through yet. For good oral health, offer water at meal and snack times and brush little teeth and gums at least twice a day especially before bedtime. Unique to Little Bistro®, our meals are slow cooked and proudly packed in clear pouches so you can see the food there's nothing to hide here. 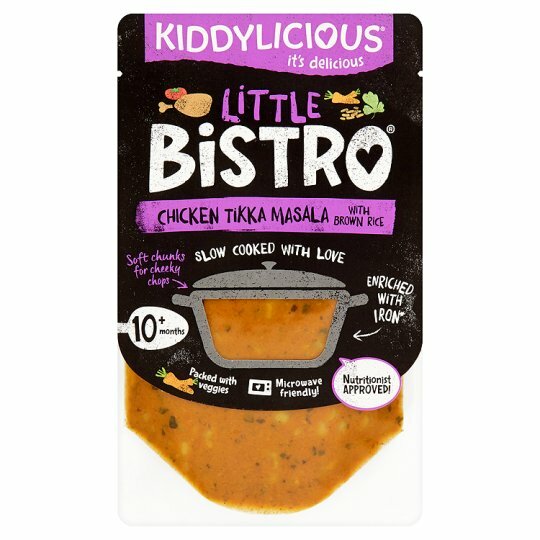 Kiddylicious snacks have been enjoyed for years and we know how important they are for your baby's development. So when it comes to meals for babies we wanted to create something truly revolutionary with your little one's developmental needs at it's heart.